Pine Park is the oldest parcel of conserved land in the Upper Valley providing recreational opportunities for residents of Hanover and neighboring towns and students at Dartmouth College for more than a century. 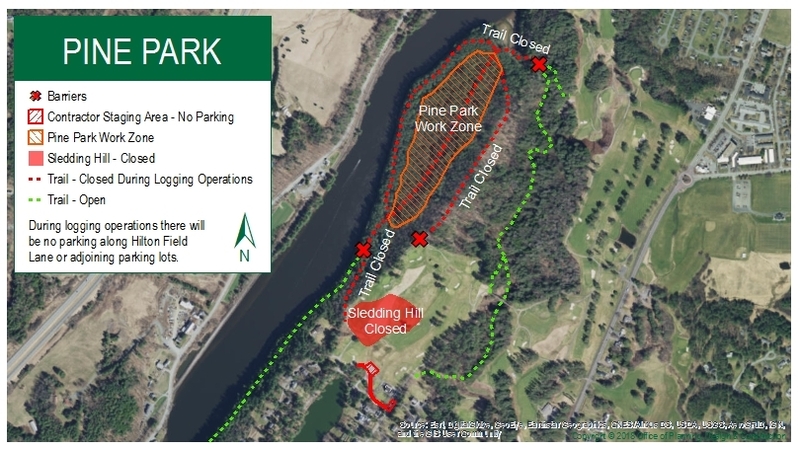 The park has multiple trails for hiking, jogging, snowshoeing and cross-country skiing that follow the bank of the Connecticut River, wind through the woods and meander along the ravine along the seasonal Girl Brook. A group of civic-minded citizens, who had established the Hanover Country and golf course in 1899, bought the adjacent land to prevent logging by the Diamond Match Company and to preserve the woodland as a “natural windbreak” along the ridge. The initial purchase of 45 acres from Arabella Hutchinson cost $4000. Subsequently, Emily Hitchcock conveyed a strip of land in 1907 to even out the eastern boundary and insure access to the park from Old Rope Ferry Road. An additional gift from the estate of Emily Hitchcock expanded the park in 1912 Some loss of land of an undetermined amount occurred in 1944, after the the Bellows Falls Power Company open the Wilder Dam on the Connecticut River . In 1906, the Town of Hanover closed Old Rope Ferry Road, then the dividing line between the golf course and the park, leaving a small section of the road to serve as the park’s southern access point. Probably around this time or sometime in the early 1920s, the trustees allowed expansion of the golf course onto park land for which they held a lease. The Pine Park Association received tax-exempt status from the State of New Hampshire in 1913. By the late 1920s, the PPA trustees became highly critical of the way the Town and College were managing the property. 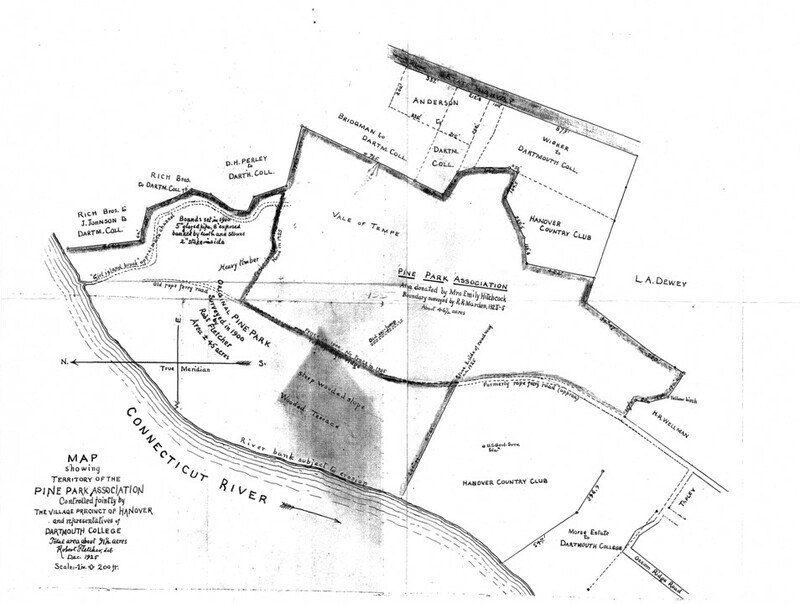 By then, the original boundary established by Old Rope Ferry Road with the golf course had been obliterated, the trails were not receiving proper attention, and the managers of the golf course were restricting access to the park trails. These issues were not resolved and remain a source of conflict into the present. Serious damage to Pine Park occurred during the Hurricane of 1938. Because the College and Town were preoccupied with cleaning up, the trustees sought financial help from the community to hire a logging team to remove the downed trees. A major change to the park occurred with the Flowage Agreement in 1944 between the Pine Park trustees and Bellows Falls Hydro-Electric. The document is highly unusual because it contains provisions requiring the company to restore any damage to the river bank. The Town of Hanover announced plans in 1961 to build its new sewage treatment plant at the north end of Pine Park near the Girl Brook outflow. Public outcry put an end to that plan. A legal opinion from that time states that the trustees remain legal owners and would have to approve the construction. Since the Pine Park Association is a public trust under the jurisdiction of the New Hampshire Attorney General’s Charitable Trusts Division, state approval also would have been necessary. The Hurricane of 1985 did extensive damage to the park and, again, the trustees mobilized public support to remove the dead trees in a timely manner. Erosion problems along Girl Brook became evident from the 1970s on as residential development becomes prevalent in the upper Girl Brook watershed. The erosion intensified after redesign of the golf course in 2001-02 as collection pipes funneled runoff into the brook. The increased incidence of 50-year and even 100-year storms exasperated the problem. Studies for the restoration of Girl Brook were completed in 2005 and 2007, but with an estimated price tag of $1 million were shelved as too expensive. Instead, the PPA trustees, town and college focused on ”hotspots” on trails for remediation and improved safety where the Girl Brook Loop Trail crosses the stream bed. In 2014, the Town designed and constructed a footbridge with $25,000 raised by the Pine Park Trustees. The bridge was dedicated to Carolyn Tenney, a long-time member of the Association board and Town Commissioner for the Pine Park. The PPA trustees in 2014 gained inclusion of the park’s Connecticut River bank in the erosion study undertaken by TransCanada as part of its FERC re-licensing permit. The IRS approved 501c(3) status for Pine Park Association in 2015. The trustees also adopted new by-laws at this time. The trustees commissioned an ecology overview by Tom Wessels and an inventory of the forest’s resources and condition by Jeff Smith in 2015. The College completed two major projects to control runoff into Girl Brook in 2016 and 2017. The College constructed bridge below 13th hole in 2017-18. In November 2018, a large number of dead pines was discovered along the Cathedral Aisle Trail, the apparent victims of a fungus.